I am, but I have a problem with it. Alomar was, without a doubt, one of the best major league infielders of my lifetime. Second best I ever saw play in person. Ozzie Smith was the best. But I can’t get past Alomar’s spitting incident. Just can’t do it. You know what I’m talking about. In September 1996, while arguing a call with home plate umpire John Hirschbeck, Alomar spit in Hirschbeck’s face. There was no denying it. Television replays showed it clearly. Alomar apologized. Hirschbeck accepted it. Now, here’s my problem. If Roberto Alomar can apologize for something he did, on the baseball diamond, and still be elected to the HOF, why can’t Pete Rose? Alomar’s behaviour was reprehensible. It’s against every societal rule we preach. It got him suspended. And that’s where my problem lies. 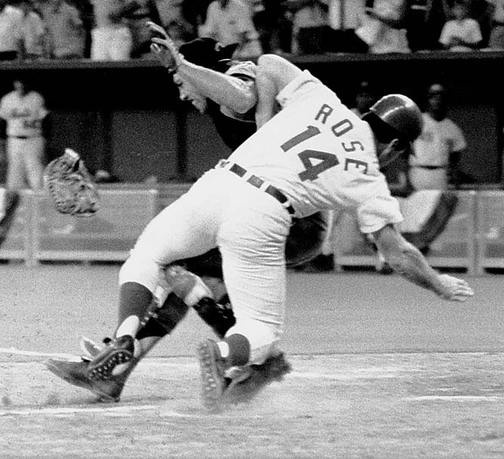 I loved watching Pete Rose play. He ran to first on a walk, and this was his trademark slide into third. Alomar was a great player. 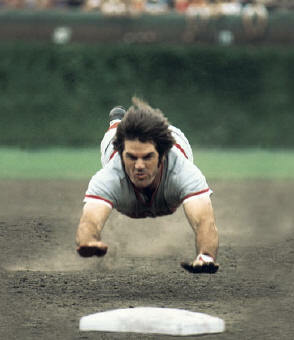 Pete Rose was a great player. Alomar took action, on the field, not befitting a Hall-of-Famer. Rose took action, off the field, most after he was finished being a player. Yet, it’s Rose who’s not allowed in the Hall. I get that he was a manager and could, apparently, affect the outcome of games. But it was his work as a player, not a manager, which would put Rose in the Hall. What he did as a manager is completely irrelevant to whether or not Rose should be in the Hall. Rose’s big problem is that he opted not to tell the truth about his betting on baseball for about a decade. He made his own bed. I understand that, but I do not understand why he continues to be punished for something he did so long ago. I hate what Pete did. It shows a distinct lack of integrity. But so does spitting in another guy’s face in front of about 50,000 people. I’m not letting Pete off the hook, but enough’s enough. Alomar got symbolically held out one year (2010) as a backlash for the spitting. Pete was first eligible in 1992. He finished being eligible in 2006. Today, the Veterans’ Committee would have to vote him in. Pete’s an arrogant so-and-so. That’s the way he played. Ray Fosse’s shoulder can corroborate that assessment. And it’s that arrogance that has dogged Rose since he retired. It’s just another part of the excuse that people use to justify the decisions to keep him out of the Hall. Frankly, I won’t be able to take the National Baseball Hall of Fame seriously until they figure out that if Alomar gets in, Rose gets in. Simple as that.